From where Daniel parks the truck, we walk towards the port. 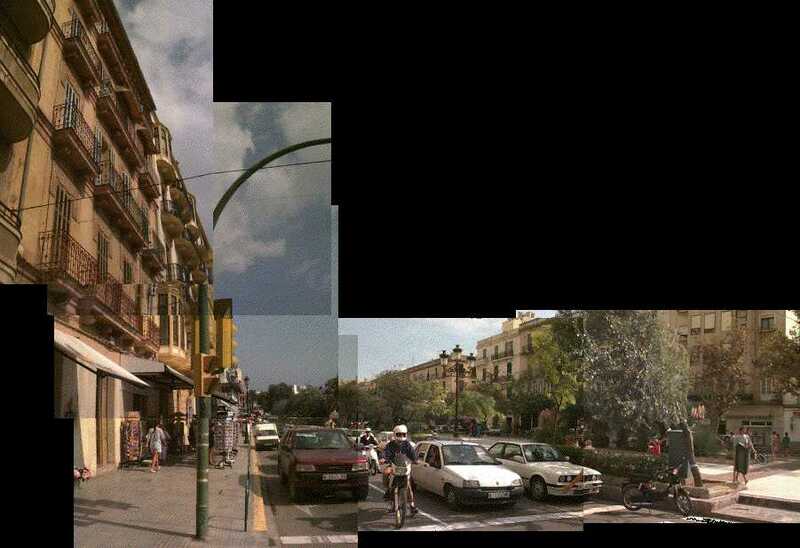 The first landmark we hit is the Placa del Rey, the two-block long "square" shown here. Just to the left is the bookstore where we've been going to get Mayra's schoolbooks as they dribble in. To the right is the Old City. 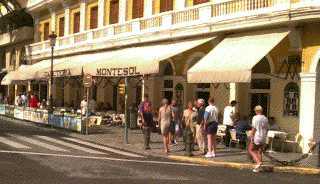 At the far end of the square, on the left, is the café Montesol (where we'll shortly be). In the square itself is book kiosk that specializes in foreign press. Just to the left of where I stand is a pharmacy. 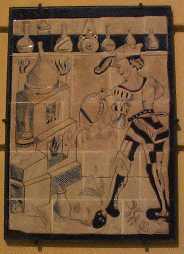 On its wall is a huge tile with an old image of a pharmacist at work. This is from the original building. Instead of going directly to the café, where Daniel and I traditionally meet at the end of errands, I decide to kill the remaining hour with a very quick stroll along the edge of the Old City. This is a small picture of the fortifications around the Old City, a small gap for pedestrians and mopeds, and then the buildings on the flat area surrounding the Old City begin. The gap is certainly less than 3 meters (9 feet). As I turn up the side streets, towards the Gypsy section of town, I see an elderly woman coming home from one of the markets, carrying several shopping bags. A baguette peers out from one bag. My time is almost up; Daniel said he'd be at the café at noon. 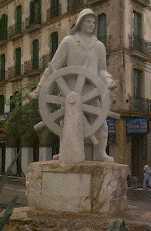 I swing by the port to take a picture of the statue of the fisherman, shown here. The sign at its base commends the generations of seamen who have provided for the island. The statue reminds me uncannily of a larger version that stands in Gloucester, Massachusetts (where I used to assistant-teach SCUBA diving). I sit down with my back to the café to wait for Daniel. One of the tuxedo-clad waiters recognizes me and comes over. Un caffè con leche, por favor, I say. He's already written it on his pad, either because he's come to know me or because that's what every tourist orders, and it's a pretty good bet to write down. I prefer to believe the former. Daniel arrives. I make the introductions. The waiter fetches a coffee for Daniel, the Englishman runs to catch the ferry back to the island. As someone or another who Daniel hasn't seen for years and years recognizes him and joins us I wander across the street to the kiosk, where I pick up the Spanish-language edition of MacWorld. I become a little indignant to find that QuickTime 2.1 is included with the US$10 magazine. I paid that price for QuickTime 2.1 only a month earlier, using my First Virtual account to purchase the software over the web. I read the magazine - slowly, because my Spanish is terrible - as I meander back to the café. Daniel switches from mellow to in-a-rush, and declares that we're late. Not for anything in particular, we're just in a state of being late. 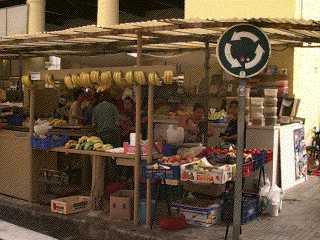 We walk back to the truck and head towards Sant Joan, twenty kilometers (twelve miles) away. While we've been gone the PowerBook has arrived from "Cut y Paste" in Barcelona. I unpack it, only to find that the right hinge has been completely torn apart and the entire plastic covering of the flip-top screen has been damaged beyond use. The video cable that runs by the hinge has been abused to the point that only part of the video signal makes it to the screen. The screws that were supposed to hold the hinge to the plastic, which now have no place to sit, have been tossed into the mix and packaged in bubble-wrap. I sit back, stunned. I check the box for damage, hoping to disprove what I suspect. The box is unmarked. This didn't happen in transit, this was done in Barcelona. Someone fixing the machine made a mistake when they were reassembling it, tore the plastic, and rather than being honest about it they decided to punt. I call Daniel in and sit him down. I show him the damage and explain exactly what's happened. (Having opened up every model of PowerBook I've ever had my hands on, I know how detailed Apple's instructions are concerning opening and closing procedures.) Daniel calls Barcelona, gets the master tech on the phone, and reads him the riot act. Ricardo hems and haws, finally admitting that they had "a little trouble" when they were reassembling the unit. Daniel tells them the unit is going back at their expense; Ricardo accepts. I head to bed with a copy of Tom Wolfe's Bonfire of the Vanities .